Frederick Henry Heath was born in lacrosse, Wisconsin on April 15, 1861. He was a self-taught architect who moved west from Minneapolis, in 1893 after working for ten years under Warren H. Hayes, a noted Minneapolis architect. His move Tacoma unfortunately coincided with the financial panic of 1893 and work was initially scarce. While records indicate that he opened his first office in Tacoma in 1896, little is known of these early years. In 1901, he became a partner in the architectural firm of Spaulding, Russell & Heath. 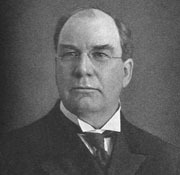 Following the departure of A. Walter Spaulding for Seattle in 1902, Heath and A. J. Russell formed a new firm; Russell & Heath. It was during this period that Heath became the official school architect for the City of Tacoma and began a long association with school construction. The partnership between Russell and Heath was short-lived however, and in 1903 Heath was back on his own. Five years later in 1908, Heath entered into a partnership with architect Luther Twichell (1867-1939), a friend and former Warren Hayes’ draftsman who had decided to move west from Minneapolis to join Heath in his practice. This partnership was also short-lived and by 1910 Heath returned to sole practitioner. In 1912 Frederick Heath’s luck with partners changed with the creation of the firm Heath & Gove (a partnership that would last the rest of his life). George Gove (1869-1956) had arrived in Tacoma from Rochester, Minnesota in 1908 and practiced on his own until joining with Heath. With business growing, in 1914 the partnership was expanded by adding Herbert A. Bell (1884 -1951). Bell was born and raised in Tacoma and had been a draftsman for Heath for over eight years. The firm name remained unchanged until 1919 when it was formally renamed Heath, Gove & Bell. This trio of architects was active in a variety of architectural designs in Tacoma and the surrounding communities for almost forty years until the death of Bell in 1951. In an interview in the Tacoma News Tribune in 1951 Heath noted on his 90th birthday that he still enjoyed going to the office every working day, and so he did until shortly before his death in 1953. The office remained open until the death of Gove in 1956. Heath’s practice lasted just short of sixty years in Tacoma and his monumental works can still be seen today across the Northwest. He served as School Architect for the Tacoma School District from 1903 through 1920, and many of his school buildings are still in use throughout the city. His firm’s work exhibited a broad spectrum of building types and scales including residential, commercial, ecumenical, park structures, hospitals and public buildings.